Dissolve the gelatin in a small amount of lukewarm water. Beat sugar & egg yolks slowly adding milk, stir constantly. Cook this mixture in a double-boiler until thickened, be sure to stir constantly. Add the gelatine and stir until completely dissolved. Allow to cool at and to room-temp. Crush the apricot pulp through a fine sieve or use a food processor. Add vanilla & lemon juice to the apricot pulp. Add this mixture to the gelatin mixture and mix completely. 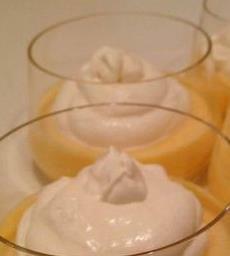 Whip the egg whites until stiff and the same with the whipping cream. Combine these two ingredients and fold into the other mixture. Pour into molds of your choosing or into small bowls and chill for 2 hours.